Water filtration systems have become a standard fixture in most kitchens today, especially as more and more scientists and health professionals report that most if not all of our drinking water supplies are contaminated with human-made pollutants, including not just municipal systems, but wells, lakes, rives, and glaciers. Unfortunately, bottled water has been shown to have its own host of problems, including serious health and environmental effects. However, while a good water filtration system is the best way to ensure healthy and safe drinking water, it’s not enough to install just any filter in your home. Though the purpose of any water filtration system is to improve the quality and taste of drinking water, there is a wide range of filters available, each with varying costs and effectiveness. The process of planning a kitchen renovation is a perfect time to consider the different water filter options. Some of the most popular filters are explained below to help you choose the best water filter for your home. Reverse osmosis is one of the most effective filtration methods available today. Even though the process has been known for over 100 years, it wasn’t until the 1950s that the U.S. government developed it as a way for the Marines to desalinate water to make it drinkable. By way of brief explanation, “regular” osmosis occurs when molecules pass through a permeable membrane to equalize the concentration of molecules on both sides. As its name implies, reverse osmosis is when the opposite occurs. Instead of equalizing the concentration of substances on both sides of the membrane, water pressure pushes pure water on one side of a membrane, leaving a concentration of pollutants on the other. Reverse osmosis typically also employs two carbon filters and/or other pre-filters, which work to remove a wide range of dangerous contaminants, including lead, mercury, and arsenic. Reverse osmosis is also effective at removing virtually all pharmaceutical drugs, coliform bacteria, E. coli, percolate, VOCs, viruses, fluoride, chlorine, chloramines, herbicides, pesticides, cryptosporidium, THMs, and MTBEs. In fact, while typical faucet or counter top filters are 1 stage filters, meaning they have only 1 basic carbon filter, reverse osmosis systems typically offer a 5 stage filtration system. Furthermore, while countertop filters have a 1-5 micron rating, which means contaminates smaller than 1 micron (such as asbestos, insecticides, may not be filter out), a reverse osmosis filter typically holds a micron rating of.0001. While reverse osmosis systems can cost more upfront, their filters only need to be replaced once a year, whereas counter top filters need replacing every couple of months. Although reverse osmosis effectively removes an impressive array of unhealthy contaminants, it can also remove important minerals that contribute to taste and health of water, including magnesium, calcium, and potassium. Some researchers suggest these important minerals are also found in common foods and are therefore not needed in drinking water. Other health professionals, however, report that long-term intake of de-mineralized water can be unhealthy and can lead to mineral deficiency and/or an unhealthy level of acidity in the body. Additionally, reverse osmosis generally requires between two to three gallons of water to produce one gallon of purified water, which some experts consider wasteful. Other popular filters include water filter pitchers, which are very easy to use and have a low initial cost. Water pitcher filters typically can reduce lead, copper, chlorine, and chlorine by-products. However, while any filter is better than no filter, pitcher filters are probably the least effective filters for their cost, especially considering that filters will need to be replaced every few months. Some pitcher filters may also be slow and prone to clog. Because pitcher filters have such a short life, they may not be practical for a family of four or more who might consume a couple of gallons of water a day. Filter faucets or filters installed directly on the faucets are also popular because, like pitcher filters, they are very easy to use. Filter faucets are usually easily placed onto the head of a faucet, and they conveniently allow a person to switch from filtered to unfiltered water. Most filter faucets effectively remove lead, pesticides, sediments, and chlorine. However, because they typically use a similar type of filter as a water pitcher, the filter needs replacing often and filtering can be slow. Another popular type of filter are counter-top water filters, which hook directly to the faucet after the aerator is removed. Counter-top filters provide a level of filtration higher than a water pitcher or filter faucet because it uses a combination of carbon filters and other filters. Counter-top filters are also less likely to clog than a pitcher filter or a filter faucet. They also allow a large amount of water to be filtered without having to alter any plumbing. Similar to counter-top water filter, under sink filters can filter large amounts of water. However, unlike counter top filters, they don’t take up valuable counter space and instead attach to pipes under the sink. They are also typically more effective than pitcher types of water filters because under sink filters offer a two-step filtering process. However, under sink filters require modification to the plumbing (sometimes by a professional) and drilling a hole through the sink or countertop for the dispenser, which may mean longer installation time than other filters. They also take up room under the sink. Kitchen renovation can be an exciting and creative time. As you consider which type of water filtration system would work best in your kitchen keep in the mind the following tips. First, you may want to either have your water tested or you may want to refer to your local annual quality report to ensure your water filter is removing contaminants specific to your drinking water supply. Second, your water filter should be certified by the National Sanitation Foundation (NSF), and, third, to ensure the life and quality of your filter, your filter needs to be maintained according to manufacture recommendations. While you may think that is an exaggeration, the reality should scare the hell out of you! First off, bottled water has an ingredients list. That in itself is ridiculous. The only thing that should be in water is…water. Why put other crap in bottled water? Well according to researchers, people do not like the taste of water. So, to improve the taste, other additives are put into bottled water. Dasani’s ingredient list contains a lot of crap. Potassium Chloride makes up about one third of that bottle of water. How many know just what Potassium Chloride is? Think death by lethal injection. Yes, I said “death by lethal injection.” For those who do not know the process for this sentence, here it is. First, the inmate is given a barbiturate. A drug that paralyses them so they cannot move follows this. Finally, to STOP THE HEART, they are injected with potassium chloride. In addition, the Coca-Cola Company puts this in Dasani water! Millions of people mindlessly drink this crap. Potassium Chloride is a mineral that is naturally found in many foods. The body does need a certain amount to maintain health. It becomes toxic if consumed in mass quantities. Our bodies do not need much to maintain health. In fact, it is only lethal if given in doses of 2500 mg/kg. So, if it is in the bottled water, it should be ok, right? That all depends on how much you ingest from other sources and how much of this crap bottled water is consumed. According to Coca-Cola, in taste testing, consumers preferred the taste of their water with Potassium Chloride. So, they put it in their Dasani water. They also state that the amount of this mineral added to their water is minute. So, there shouldn’t be any adverse health effects. It is ok to drink the stuff just because their research shows that you want good tasting water. So, let’s look at some interesting ways Potassium Chloride is used. First, it is a naturally occurring mineral. We get that. But, it is also a by-product of producing nitric acid using potassium nitrate and hydrochloric acid. Most of the Potassium Chloride by-product produced is used in fertilizer. Plants need this to grow. It is also used in producing potassium hydroxide and metal. Oh, and get this, it is used as a completion fluid in oil and gas industry (fracking ring any alarms?). Now, what are the side effects from ingesting too much of this poison? Well, some are minor and you may not realize you are suffering from it at all. Others are terrible and you could become gravely ill. Gastrointestinal discomfort, vomiting, diarrhea, nausea and even a bleeding gut are side effect of too much Potassium Chloride. Extreme overdoses of it can cause cardiac blocks, fibrillation and hyperkalema. The list continues to include kidney disease, Addison’s, ulcers, chronic diarrhea or intestinal blockage. Pregnant or nursing women should most definitely NOT ingest too much potassium chloride. The FDA has shouted this warning, “Do NOT use medication containing potassium chloride if you are pregnant, plan to become pregnant or breast-feeding. We have warnings on cigarettes and other potentially health threatening items, but there is no warning on Dasani water bottles. The next time you consume 6 or so bottles of Dasani, pay attention to how you feel. You may experience an irregular heartbeat, feel light headed, faint, chest pain, sweating, nausea and even seizure or coma. I say, skip the bottled water no matter what brand. Bottled water is simply a waste of resources. Filter your own home water with a quality water filter and purchase refillable water bottles to take along while traveling, or to school or work. Save money, save the planet and even save your health. While the term osmosis is well known to junior high school students, reverse osmosis often first becomes known to those individuals who read the side of their bottled water bottles. Reverse osmosis is, quite simply, a method in which water impurities are taken out of a bottle of water thereby making the water safe to drink. However, how does reverse osmosis work as a water purification technology and what impacts the quality of the reverse osmosis process? These concepts will be the focus of this article. To understand reverse osmosis it is important to understand osmosis. Osmosis works through the movement from a liquid that contains a high concentration of a substance into that of a lower concentration of a substance in a natural process. For example, if water with a high concentration of salt is put with water with a low concentration of salt, over time these substances will blend to perform a uniform level throughout once the substance passes through a membrane. Reverse osmosis relies on a scientific method in which high pressure is used to push water through a membrane that is semi-permeable. The pressure is used to reverse the natural flow that is present in osmosis. Osmotic pressure is used to push the substance through the membrane thus removing various particles and substances you wish to remove. A common usage of reverse osmosis is removing salt from sea water. While this often sounds similar to filtering, it is more advanced than that. Filtration methods typically exclude certain membranes based upon the size of the various particles involved. These particles cannot pass through the filter thereby preventing them from getting into the final substance leaving a purer substance behind. The scientific process that is used in filtration is size exception. Under reverse osmosis systems the semi-permeable membrane works primarily with pressure that exceeds the normal osmotic pressure which, when applied at different rates, results in the variance in the concentration of solutes to be transferred to the final pure water. This disrupts the normal osmotic process. When a high amount of pressure is applied alongside a high fluctuation of water to a semi-permeable membrane, only the pure portions of the water are able to penetrate the membrane. The remaining insoluble portions are not permitted the time to pass through the membrane and are flushed out of the system before portions are allowed to penetrate the membrane. A reverse osmosis system for water purification is typically separate from filtration methods, in practice. Generally, sea water or other brackish water follows several processes to purify it, including reverse osmosis and filtration. Filtration removes larger particles and reverse osmosis completes the filtration process leaving potable water behind. Further, ultraviolet lights are used to further kill any bacteria that may have been able to make it through this process which adds to the purity of the process. Reverse osmosis thereby provides an alternative method of water purification that is increasing in quality and popularity and increasing the amount of potable water available for consumption. This article was written by Thomas Jay, professional writer for Sustainable Water Solutions. Thomas is from Orlando, Florida where he lives with his Wife and their two children. Drinking pure, clean water is a cornerstone of health, and you should pay close attention to the purity and quality of the water you consume. Distilled water was around long before the benefits of alkaline water were popularized, and it is still widely marketed and consumed today. But do you know what really happens to water when it is distilled, and how it can affect your body? To make distilled water, water is boiled and evaporated away from its dissolved minerals. The vapor is condensed, and the resulting water droplets are collected. Distilled water is an active absorber; it quickly absorbs carbon dioxide and becomes acidic when it makes contact with air. Since it is free of dissolved minerals and other particles, distilled water has the ability to absorb toxic substances from your body and eliminate them. Distilled water may be helpful when you’re detoxifying for a week or two. But the longer you drink it, the more likely you are to develop mineral deficiencies and an acidic state. You run the risk of rapidly losing electrolytes – sodium, potassium, and chloride – and trace minerals. This can cause cardiac irregularities, high blood pressure, and emotional or cognitive disturbances. However, the problem with distilled water doesn’t end in potential mineral deficiencies. The dangers of disinfection byproducts (DBPs) in most treated water supplies, such as trihalomethanes (THMs) and haloacetic acids (HAAs), are created when chlorine and other water treatment disinfectants react with natural organic matter present in the source water. Studies show that DBPs are over 10,000 times more toxic than chlorine. Of all the toxins and contaminants present in water (including fluoride and pharmaceutical drugs), DBPs may be the worst. Distilling water actually worsens the presence of these toxic contaminants in water. This is because anything that vaporizes at a lower temperature than water, such as volatile organic compounds (VOCs) and THMs, will also be boiled and condensed. While the heavy metals are left behind (e.g. lead will not vaporize), chlorine will still change into chloroform during distillation and will still be present in your distilled water. Not only will distillation fail to remove DBPs, but it may also deliver a more concentrated dose of them. Distilled water is expensive, energy-intensive, and does not remove VOCs or DBPs. It draws out chemicals and metal contaminants from whatever containers it’s stored in, and it leaches minerals from your body, potentially leading to health problems. It may aid in short-term detoxification, but the drawbacks outweigh the perceived benefits. What you should aim to have is pure, clean water – not too alkaline, not too acidic. The pH of your water should ideally be close to 7 (neutral). Somewhere between 6.5 to 7.5 is acceptable. Additionally, you can normalize your pH not by drinking alkaline or distilled water, but by simply juicing vegetables. It is also recommended to use a reliable water filtration system at home for the purity and protection of your family’s drinking water. Pamela Schroots is currently creating a report on the benefits of using a whole house water filter for all-around protection of your water for drinking, showering, and household needs. She is also a business intrepreneur and a mother of two lovely kids. A report on USAToday indicates that good ole fashion water is America’s favorite drink. I think that says we are becoming more aware of what we are putting in our bodies. Soda, energy drinks, and sugary sweetened drinks have been replaced! …soda’s run as the nation’s beverage of choice has fizzled. This is great news. Now, if more people would choose to filter their home tap water, and save the environment as well as their health. Currently, people drink 21 gallons of bottled water a year. That compares with 37 gallons of other water, which includes tap, sparkling, flavored and enhanced waters such as Coca-Cola’s vitaminwater. The EWG reviewed 20 million water-quality tests from the past five years, and found that the water flowing to about 85 percent of the population contains 316 contaminants. Of those, 202 chemical contaminants are not regulated by the Environmental Protection Agency, meaning that any water supply can have any level of the pollutants and a municipality doesn’t need to take action to remove them. In some cases, those pollutants are at low levels and don’t cause harm to human health. In others, however, the problems could be serious. For example, perchlorate, a component of rocket fuel that was recently detected by the Centers for Disease Control and Prevention in nearly all Americans tested, is one of those unregulated chemicals, and it can interfere with the body’s thyroid-hormone production, which could lead to metabolic disorders and diabetes. EWG also used its data to rank cities with the best and worst water supplies, based on the number and concentrations of hazardous chemicals found. At the top of the list were Arlington, Texas; Providence, Rhode Island; Fort Worth, Texas; Charleston, South Carolina; and Boston, Massachusetts. The five worst? Reno, Nevada; Riverside County, California; Las Vegas, Nevada; Riverside (city water supply), California; and Pensacola, Florida. Did you resolve to loose some weight this year? If you live in a city listed above, you will want to invest in a quality water filter. Of course, you could purchase bottled water, but studies have shown, most bottled water is just filtered municipal water, with the same contaminants as your tap water. Bottled water is also expensive. So if you resolved to spend less, then really, bottled water is not the answer. The answer would be to find out what is in your own tap water, have it tested, or start here, http://www.epa.gov/safewater the EPA supplies a list of common water contaminants, and they also have resources close to you for testing your water. 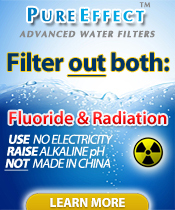 Once you determine what it is you want to filter out of your water, purchase a water filter that will remove it. Then you can drink your own tap water, safely.